Juventus took a commanding two-goal lead in their clash with Chievo on Monday night, with Emre Can doubling their tally with a fine goal. The Bianconeri were looking to go nine points clear at the top of the Serie A table with a win, as they returned to action in the league for the first time in 2019. After Douglas Costa fired them ahead early on with a great individual effort, there was a wonderful team move which centred around Paulo Dybala which helped them take full control of the encounter. 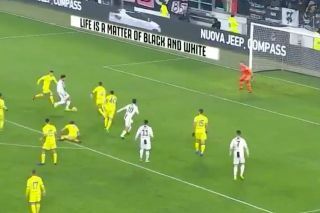 As seen in the video below, the Argentine playmaker showed great feet to dribble his way into the Chievo box and he kept his cool to find a nutmeg assist to put Can in on goal. The German midfielder made no mistake from close range, as he showed great composure to collect the ball and pass it into the back of the net for his first goal for the reigning Italian champions. Juve could of made easy work of their night shortly after the interval, but Cristiano Ronaldo was unable to convert from the penalty spot as he saw his effort saved in the 51st minute. Juve get their second and it’s lovely team goal with some clever, quick feet from Paulo Dybala to knock it through to Can! ?